The colour is dark amber. The nose is sweet with notes of berries, dried fruits, oak, spices, furniture varnish, sweet fruits, vegetables, chocolate and stain. The palate is sweet with stain, spices, dried fruits, light sourness, raisin and chocolate notes. The finish is long and sweet with dried fruits, spices, raisin, oak and chocolate notes. 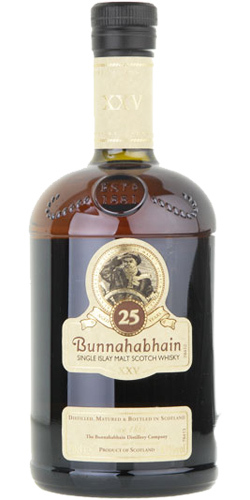 The Bunnahabhain 25 is a very good balanced, tasty whisky. I like it very much! I gave 90 points. 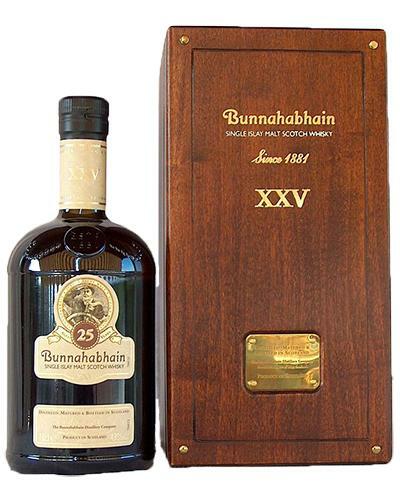 I recently tried this one and Bunna XVIII again after a few years, and was surprised. I'd always held the 18yo as the better one, but this time it felt more prominently boozy than before, while the XXV really won me over with its excellent body and refined aftertaste. 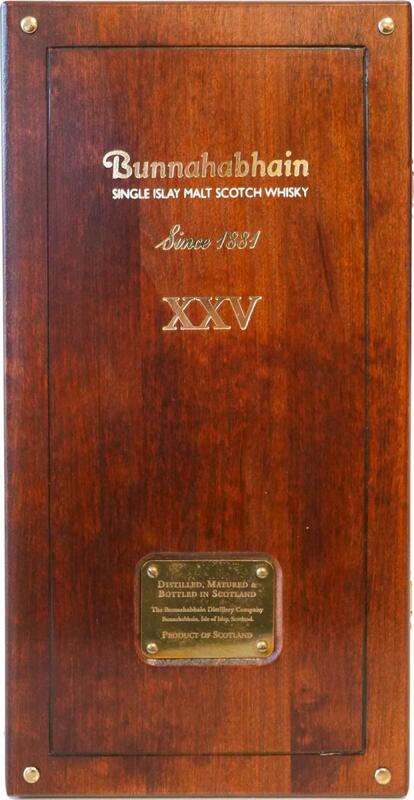 A bit too pricy for me to purchase a whole bottle, but a very good whisky nonetheless. Deep wooded, more and more fruity and chocolatey. Juicy fasts. Warm, on the nutty. A touch of tangerine. Fade and very nice. Moderate spices, honey. Juicy in the mouth. He is greedy and well corpulent. Each sip is easier than the previous one. Woody, dries slightly, while keeping its sweetness. 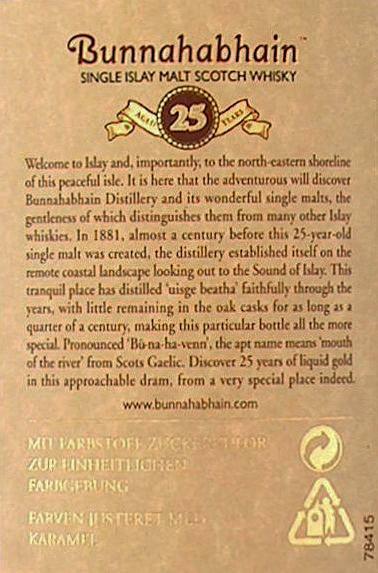 As usual, the Bunnahabhain are pretty fine. But at this 25er I was rather disappointed. The XVIII I liked better. But what others are out there, 20 different scents, is amazing. They have to be great experts. That no one has written lizard tail in vanilla pudding, is a miracle. on Neudeutsch: The pudding schmekke wi nutti tutti frutti or something. Is a blatant man. The 18s blatantly better. 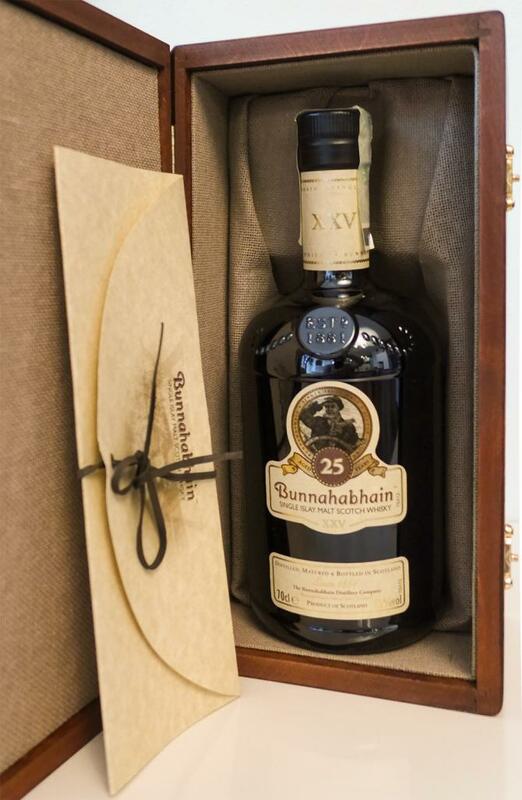 A bit humble for this big 25yo - probably the balance and smoothness are the biggest points. Nose: Overall, quite thin with little "biting" spiciness. Chocolate, leather, delicate tobacco notes, vanilla, caramel waffles and a hint of peat with a dull barrel tone. Absolutely straightforward and kept clean. Taste: Thin and soft starting with wood, caramel, oranges, slightly salty spice and fresh herbs. Becoming and becoming up to the finish emerging, slightly creamy Schokonoten. Finish: Medium length - fresh and delicately spicy with fruity hints of apples, oranges, vanilla, nut oil and herbal essences. Chocolates made of dark chocolate filled with Islay Malt. A dry sherry sweet, a little citrus, some roasted coffee and a saltiness. Starts creamy, salty and continues with iodine, sherry, beautiful wood notes and coastal flavors. The whole thing very mild, balanced and complex. Long and dry with sherry wood aromas and a slight bitterness.